With the motto: Free ultrafast Wi-Fi. And that’s just the beginning, LinkNYC moved to London UK and started to deploy the kiosks using the same business model. From a business model perspective, the initiative is really cool. Governments are providing a new set of services throughout part of the cities, such as WIFI, access to the internet (through a screen), charger, free phone calls, among others. Why is so interesting? The equity from the government is 0, the equity from the private sector is 100%. The way this genius made it possible was simple. What a corporation like Coca-Cola, American Airlines or Samsung would like to have in cities like NY, London, Hong Kong? One square foot, or maybe 3 to promote your services at every corner through very technological devices. That was exactly what it was offered by this private-public innovation. The government does not allocate equity, but provide a space to deploy these devices that provide services to the population, at the cost of showing advertising at every corner o the city. A good decision? It depends. Nevertheless, today we want to look at the technology and the supplier. 1.- You need a city where land is so expensive that even for a big corporation is too costly. 3.- Find out the companies interested in promoting their services and products through the platform. In many countries of Africa, they still struggling with the provision of basic services for most of the developed and developing countries. Clean water and energy. While some solutions are able to provide energy, others can provide water. In today’s world internet it is also a need for having access to information. What if one device can provide you the 3 needs. This concept was analyzed by Watly. 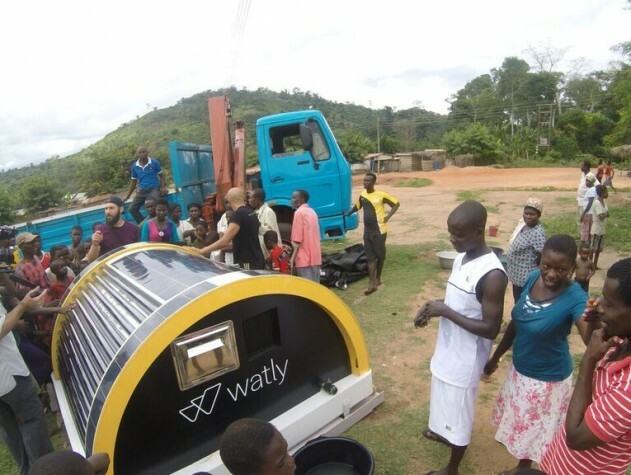 This device is able to provide drinkable water, through a smart system that purifies the water by using the energy generated by the solar panels. But In addition, it uses the energy generated to provide internet service as well as to provide electricity. Therefore, they were able to link and optimize a device (figure 1) to address 3 of the most pressing issues of undeveloped countries at once. 1.- Fundraise to pay the solution. 2.- Understand the optimal size or number of devices required to cover the demand of water, minimum energy, and internet for the community. 3.- Enjoy the privileges of a great percentage of the world population! Mining industry forecast a tremendous contribution in providing the metals for the tech industry. Industries such as copper, lithium, among others, are intensively investing in technology to overcome bottlenecks reducing performances. IoT devices, if WiFi limitations are covered, can provide solutions for monitoring key elements of the mining operations such as truck transportation, material storage, and exploitation. In addition, it provides alternatives to increase security in the fields, as well as to create a fast communication from field issues and concerns to the operating departments. 1.- Understanding the operation & finding solutions. 2.- Presenting proposals to mining corporations. By Gabriel Guggisberg, week 3.